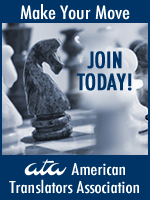 Each month the ATA Business Practices Education Committee contributes a column entitled “Business Smarts” to The ATA Chronicle that discusses various management practices and business-related questions submitted by translators and interpreters. You can find this column online at atanet.org; in fact, this article was taken from the column at http://www.atanet.org/business_practices/smarts_2008_may.php. It addresses many factors involved in answering one of the questions most frequently asked by freelance translators and interpreters: what should I charge for my services? The article also mentions the issue of why ATA members don’t discuss their specific prices. We think these answers are crucial to any freelancer starting out in their career and may also benefit more seasoned freelancers brushing up on business practices, so we’ve included the article below. Enjoy! Finding appropriate pricing for a service is one of the first challenges of establishing a business. Many factors contribute to finding a price that is attractive to clients, includes room to grow, and appropriately reflects the level of service provided. I would like to supplement my income by doing translation work on the side. I called a few people listed on ATA’s website, but nobody would give me any information about the going rates. How much can I charge for translations? The American Translators Association does not itself issue price recommendations and, for legal reasons, discourages any such discussion by its members. This is why you were unable to gather specific information by phone. In addition, there is no such thing as standard “going rates,” since market prices vary by language combination and the technical difficulty of texts. To arrive at an appropriate price for your translation services, you will need to analyze a number of factors. These include your professional qualifications, your expertise in specific fields, the market you would like to target, and, of course, your cost of doing business. Starting with the latter: you will need, at a minimum, an up-to-date computer, a basic set of dictionaries, the fastest Internet connection you can afford, and possibly specific software such as a spellchecker program for your language combination. You will also pay a self-employment tax on your translation earnings. Your translation price needs to include a sufficient allowance to cover all these fixed expenses, since you may end up losing money otherwise. Your overhead should also account for the time you spent marketing your services, communicating with clients, administrative tasks, and bookkeeping. Regardless of your language combination, linguistic background, and expertise, you must be fully qualified to do translation work, even on a part-time basis, and be aware of the various expectations of translation buyers. It might be useful to “inventory” your qualifications, including degrees, other credentials (including ATA certification), language skills, expertise in specific subject fields, residence or other experience outside the U.S., and actual translation work performed. Take a look at the online profiles of colleagues with similar qualifications, for example, in ATA’s Directory of Translation and Interpreting Services or other translator portals, such as ProZ.com and Translators Café. These sites also include extensive discussion forums with helpful information. You can also browse past job offers in your language combination and area of specialization to view price offers. While prices may be on the low end on auction websites, they at least provide a guideline for price calculations. The best mathematical approach to arriving at a suitable price would be to define a gross hourly income (including overhead and taxes) that would make it worthwhile for you to work as a translator rather than, say, at a part-time retail job. Seasoned professional translators can produce about 300-400 words of finished text in an hour, meaning that the text is thoroughly researched, correctly translated, and fully edited. Divide your desired hourly net income by this word count to arrive at the price you would need to charge per word. Hine, Jonathan. Is This Still Worth It? An Update. McKay, Corinne. How to Succeed as a Freelance Translator.